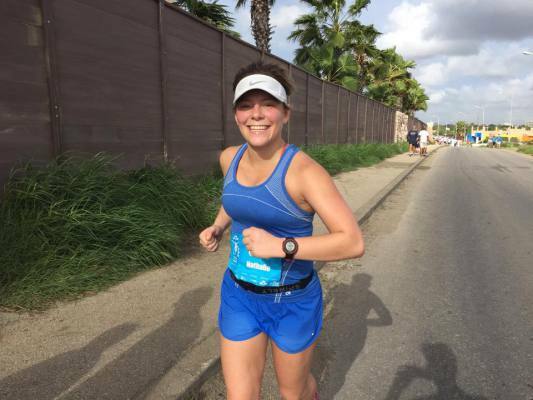 The author (Natalie DiBlasio) during the final stretch of the Curaçao Marathon in December. It’s not every day that you’re nine miles into your marathon when the roosters wake up. 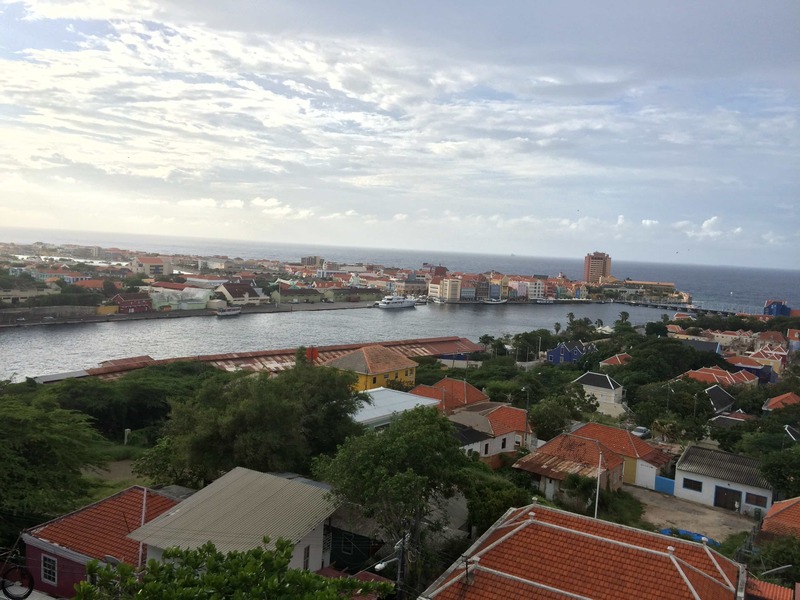 At 5:30 a.m. it seemed like every home in Curaçao had it’s own personal rooster alarm clock signaling that it was time to wake up. I laughed to myself when I realized I’d been awake since 2:30 a.m. — well before the roosters. In Curaçao, a beautiful Dutch island in the Caribbean, the day heats up as soon as the sun rises. The 4 a.m. start? Perfect. 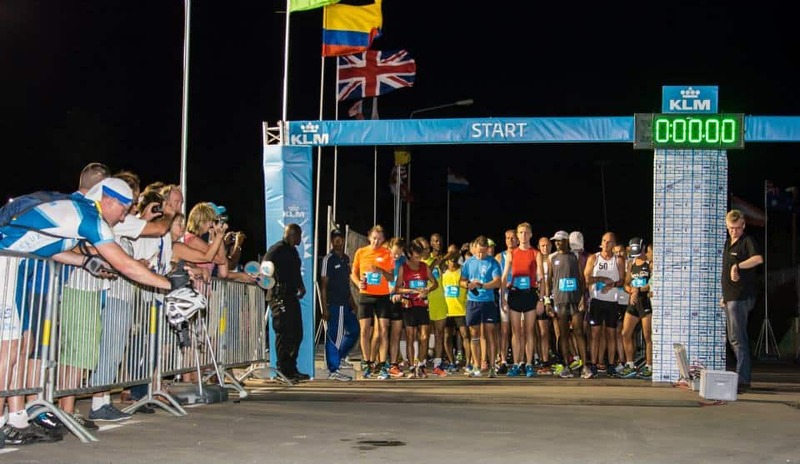 The KLM Curaçao Marathon and Half Marathon is a beautiful course – two loops for the marathoners, one loop for the half marathoners. Of the 1,500 runners – I was one of 81 to start the full marathon – 75 finished. I’d say being the only runners to complete a two-time loop, we can consider ourselves experts on the inaugural course. The race started and finished at the Lions Dive Hotel and Resort. The hotel offered a beautiful pre-race buffet for runners — unfortunately for me, my stomach can only handle a plain bagel before a marathon. The start was relatively quiet with less than 100 marathoners at the start. The races were staggered: full marathon start at 4 a.m., half marathon start at 6 a.m., 10K started at 7 a.m. and 5K at 7:30 a.m.
With an intimate group of just 80 or so marathoners – everyone was friendly and quite chatty. 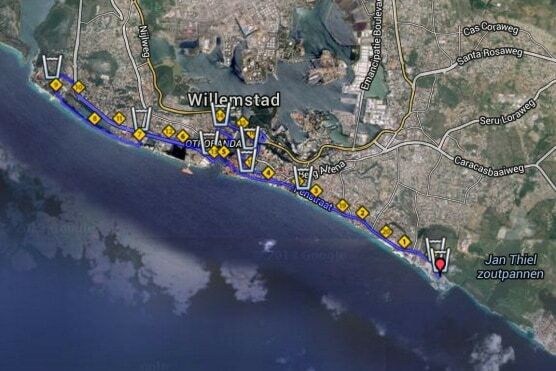 I ended up running for miles with athletes from Curacao, Trinidad, Aruba, Holland and Sweden. The race took off through a neighborhood, through downtown, across the “swinging old lady” – a pedestrian pontoon bridge that swings with the current, along the Curaçao waterfront, over the Juliana Bridge — a 185 foot climb over the sea and back through to the Lions Dive and Beach Resort. From the get-go I tossed my time goals out. It was hot, humid and hilly. 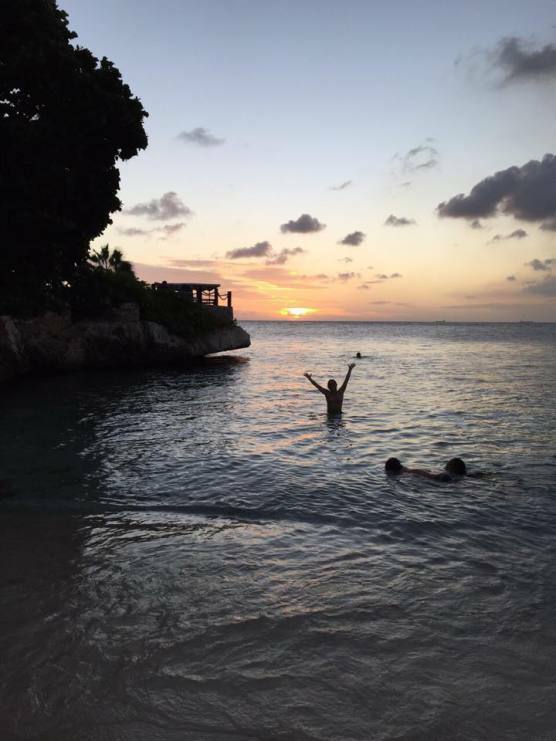 Not at all conducive to a PR, but when you’re running on a beautiful island — some things are more important. First priority: Take in the scenery. I was sweating like crazy by mile two so I was happy to take it easy, pointing out the brightly colored houses and unique architecture in the neighborhoods. When I sign up for an inaugural race, I always expect a little bit of confusion — whether it be in the race course, organization, fuel or just some general chaos spattered throughout the event. That wasn’t at all the case with this marathon. The course was wonderfully marked at every turn, either with clear signs or cheery volunteers shouting out “success!” “go go go!” and a number of other greeting in multiple languages. There were water stops placed every two miles or so – handing out bottles of water. My college roommate would have had a heart attack at how many bottles the race went through, but from a point of convenience it was really helpful to dodge the usual cup scenario. I took one at almost every stop and finished it by the time I hit the next one. That’ a testament to just how hot it was, especially for the second half. For the first time around the course, everything was dark – lit by the moon and streetlights. When we came up on the “swinging old lady” bridge, we were greeted by cheering volunteers – even at 3 a.m. – and a beautiful array of colorful lights glowing over the bridge. We left the bridge, smiling for any of the dozen photographers scattered throughout the three mile stretch, and took a turn into a fort. Back through the downtown area, through winding streets and suddenly crashing waves came into view. No more than 10 feet from the course, out of the darkness, I could see the foaming white tops of waves crashing into the shore. Next to me — clearly alarmed by the same beautiful moment, a runner from Sweden gasped. We chatted briefly about the breathtaking morning and then went back into our own zones. After a bit more than a mile along the water, we started up hill. Very up hill. The course wound us around to a hydration stop that gave out something called AA Drink, it tasted like Gatorade, but a little less intense. From that point, it was “alls uphill” until we climbed the bridge. What I thought would be the most painful, challenging part of the course was instead over in a flash. As soon as I climbed high enough to see over the edge of the bridge was distracted by the beautiful city lights. Down below I could see the bright colors of the Swinging Old Lady and the lights of the downtown buildings twinkling in the distance. After smiling for more photographers and a few video cameras I began the descent back into town, this time with the soundtrack of roosters surrounding me for miles. I smiled at the sound and headed back down a road we’d run earlier and in for the home stretch – well, the halfway home stretch, back to the Lions Dive and Beach Resort. By now, about 6:05 a.m. some of the half marathoners were passing by, heading for their loop on the course, as we came in for our turn around. The blasting music and cheering crowds helped me pick up the pace as I crossed the halfway point in what is my slowest, and one of my favorite, half marathons to date. As I left the Lions Dive, I was excited to pass by the sights a second time — now in the light. As we ran again down the neighborhoods I smiled at families I’d seen earlier sitting on the side of the road, cheering on the runners. I put a little dance into my step as I ran past the Curacao Tourism Board building which was blasting music from their porch. I sped up in anticipation of the Swinging Old Lady, excited to take a look at the water and beautiful colored buildings that looked over it. Through the fort again, along the shops, back down the street and again — I was startled by the crashing waves which seemed to appear out of nowhere. It was during this second stretch along the water that I started to feel really tired. The morning was warming up and the heat was wearing on me. I decided to switch to a walk run approach, especially when I wasn’t around any shade. This slowed things down quite a bit. Between the walking and the heat, I finished more than 45 minutes slower than the marathon I’d run in Washington, D.C., just about a month earlier. But again, it didn’t matter. As we went over the enormous bridge for a second time — I did something else I’d never done before — stopped to take a picture. The view from the top of the bridge is like nothing I’d ever seen before. The run back into town — as the last 10K of most marathons are — was hard. Hot, exhausting and painful. Crowd support remained strong, even after the 10K, 5K runners and half marathoners had mostly finished. Still, as the worn marathoners inched along, water was plentiful, cheering was as loud as ever and the sights were remarkable. 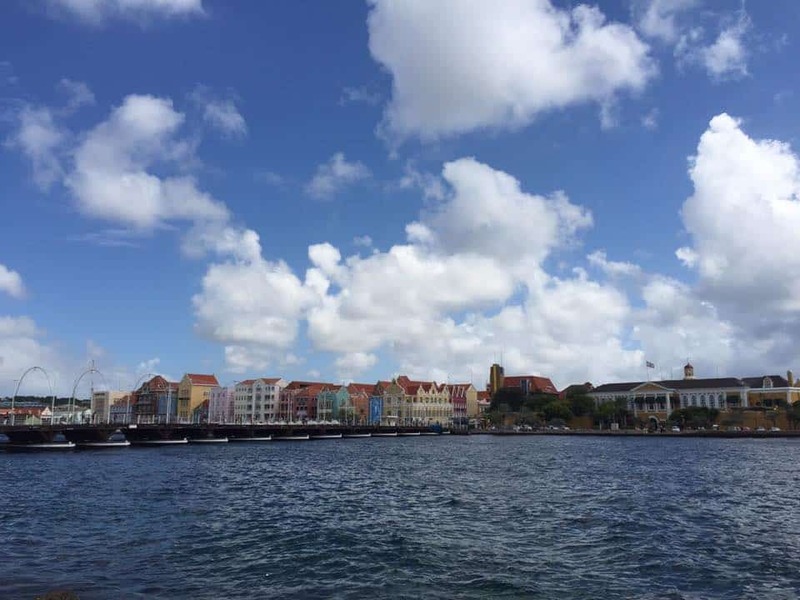 Clear blue water, brightly colored buildings, sun glistening on the rooftops. It was a moment I’d never forget and certainly would never be able to describe. I took the photo and as beautiful as it is, it doesn’t do the moment justice. But that’s okay. The moment is for me, the picture for everyone else. Having fun after the race. Even the walking portion of the run/walk had grown tiring in the heat but soon familiar sights I recognized as close to the Lions Dive appeared. As I cruised in through the finishline which was long past the bustle of the returning half marathoners, 10Kers and 5Kers, music was playing and the crowd was cheering. My time, 4:52:27, was a side note as I placed the medal around my neck and slipped off my running shoes so my blistered feet could feel the warm sand. This race was a beautiful reminder that time isn’t everything. 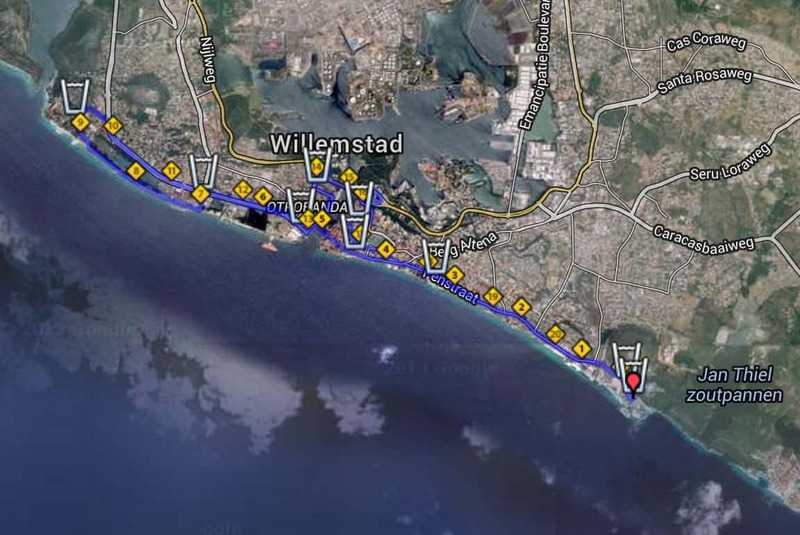 Running through the dark streets of Curaçao accompanied by rooster sounds, wagging tails of stray dogs, greeting in languages I didn’t know and the sounds of crashing waves made for the most unique and beautiful 26.2 miles I’ve ever traveled. Going forward, in addition to training for marathons to break my time goals, I’ll be sure to toss in races like this one. Races that remind me of the beauty of running — exploring a new place on my own two feet. Thank you, Natalie, for such a great description! I am running the marathon in less than three weeks and can’t wait to hear the roosters and see the waves crashing! !